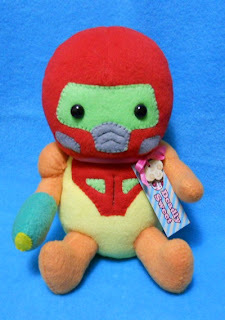 Yeah, that's right: A cute-as-hell Samus Aran plushie. Have you ever seen anything so cute? If your answer is anything other than "no," you're lying. This particular plushie was made by Canadian textile artist Michele Legendre (aka misscoffee), by the way. For more examples of her talent, check out her deviantart.com gallery. It came up in my top sites panel, and even from the thumbnail I went, "AWWWWW!" Holy cute! I just want to squeeze her! And MY GOD is her site cute. I had to stop looking, because my wallet had a toothache.